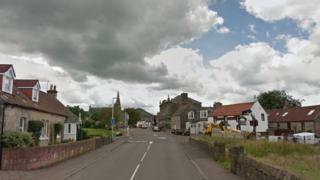 A pensioner has died after she fell on board a bus which braked to avoid a crash in Fife. The 82-year-old woman was taken to hospital with a serious head injury following the incident on Monday at about 12:00. The number 64 Moffat and Williamson bus was travelling through Freuchie's east end when it braked. Police confirmed the woman died in hospital on Thursday evening. Inquiries are continuing. Anyone who witnessed the incident has been urged to contact police. Sgt Nicola Young from Fife's road policing unit said: "This has been a tragic incident which has resulted in the loss of this woman's life. "Our thoughts and sympathies remain with her family and friends at this time.